this is on most of the other boards im on! Be good if some specs and your location too! Seen it, love it, Got it as my background. Gotta love those notchbacks. Former 1987 MK2 CA20E hatch and 1985 Turbo hatch owner. 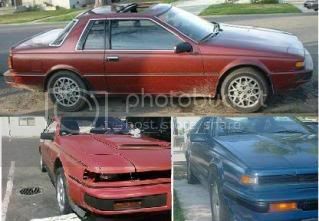 Still an S12 enthusiast and hope to buy another sometime in the future. dammit, i want a set of those! Yea, I got almost a complete set, I\'m just missing one side skirt. Its actually an 11 piece kit: 3 front bumper pieces, and 4 side pieces (per side). And yes I want the rest of the kit. Secondly, how do I post a pic from my hard drive? I have 2 pics but I dont know how to post them. HELP! Decksla your car looks sweet as usual, that must be able the 15th set of rims i\'ve seen on it though hehe. I like the extractor vent in the bonnet bulge and of course i love the black bonnet hehe. Nebuchernezzer I modified your post to add your picture. hope you don\'t mind. Can anyone help me?? I dont know how to post a pic off my hard drive! if you send me the file i can host it on my webspace. wont be up till tomorrow but. you can upload them to a car domain web page then put them between the tags .Or send them to me and I will post them. Okay, You might need to e-mail me with your address. Mine is available for you to look at. I only have 2 pics. itll be the last set! man you got some mighty big rubber on the front of your car! Oh, Magnum, I dont have a Cardomain account. in my car domain... which reminds me, could anyone do a photochop for me? sure, depends what it is. email me the pic at [a href=\'mailto:dextere@toll.com.au\']dextere@toll.com.au[/a] and ill see what i can do.